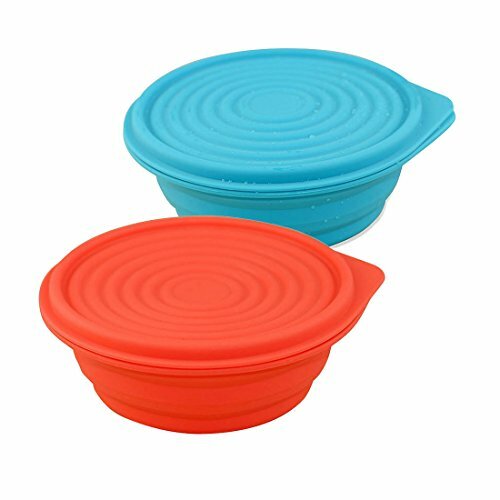 ●This Collapsible bowl is made from 100% reusable food-grade silicone, which is FDA approved and BPA free. ●The material can withstand temperature from -40° to 572°F which can be heat in microwave. ●The silicone is high quality and it can go through microwave quite well. ●It is perfect for all conditions, such as dishwasher, microwave, and freezer. storage or transport, taking up no space in your backpack, suitcase, saddle bag, etc. ●It folds easily, thus great for camping trip, hiking, travel, lunch, picnic and sport events. When finished using these bowls, just collapse them for convenient storage in a drawer or cupboard. Superior Quality: Made from 100% reusable food-grade silicone, capacity 1.2L.which is FDA approved and BPA free; It's also very sturdy and not flimsy like some cheap silicone. High and Low Temperature Resistance: The material can withstand temperature from -40° to 572°F. It can hold hot water and can go through the microwave quite well. Impress your family and friends with this innovative set of rubber silicone drinkware, they really look and feel great, which also makes them a perfect gift,Fill them with your favorite beer, water, fruit. food .Buy a set for yourself and as a gift for any occasion! Ultimate Party Cup! Mom's love these for their small children and their college bound kids! 100% Satisfaction Guaranteed! If you have any questions about this product by LTFT, contact us by completing and submitting the form below. If you are looking for a specif part number, please include it with your message.